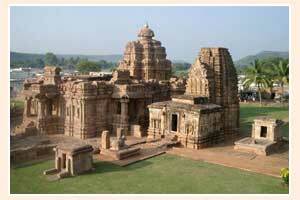 The group of monuments at Pattadakal are situated in the southern state of Karnataka. They were built up in the 7th and 8th centuries under the Chalukya dynasty of medieval India. The temples portray a harmonious blend of northern and southern Indian forms of architecture in vesara style. The monuments consist of a series of nine Hindu temples and a Jain sanctuary. Number of plinths and small shrines are also present here. Out of the nine temples, four were built in Nagara style, four in Dravidian style and the Papanatha temple is built in mixed style. They were enlisted in the World Heritage List in 1987.